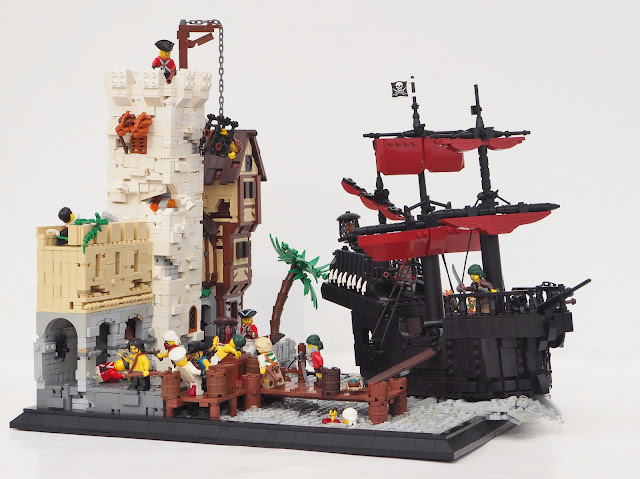 LEGO Fan and flickr.com member W. Navarre shared his latest MOC for contest entry to The Tourney on MOCpages. Navarre revamped an old Castle set 7029 Skeleton Ship Attack. He perfectly recreate the famous Pirate ship which attacks to Harbor. Brickbuilt buildings in the harbor are more detailed and colorful than the old set but the ship is quite different and impressive. I really like and admire the brick built ships which contains no huge hull elements. Navarre is very talented to create such a perfect black ship.